There seems to be a perpetual, inherent tension amongst Pro Stock Motorcycle racers. It’s natural considering the ultra-expensive, high-stakes competitive class showcases three very dissimilar, distinct motorcycles. Suzuki GS, Harley Street Rod and EBR Buell racers all strive for parity and competitive advantages to win as many Wallys as possible. Vance & Hines’ nine-title dominance on exclusive Harleys, compounded by being the Suzuki engine supplier has been the perfect formula to breed animosity and controversy. The NHRA’s latest decision to add 15-pounds to the v-twins ignited fierce debate. Suzuki racer and 2016 class champion Jerry Savoie has been dismayed, disgruntled and jaded, arguing his engine trails the v-twins by 20-30 horsepower. Savoie thinks 15 pounds was not enough to make a difference. Defending class champion Matt Smith, who following development help by former sponsor Victory, maintains his own motor program, passionately feels his team is being penalized for working hard over the off-season. Smith was critical of the Suzuki teams, saying the onus is on them to not rely on Vance & Hines, to develop their own motor programs, upgrade their chassis and components and work harder to advance their programs. Smith says that formula is what has garnered him so much success. 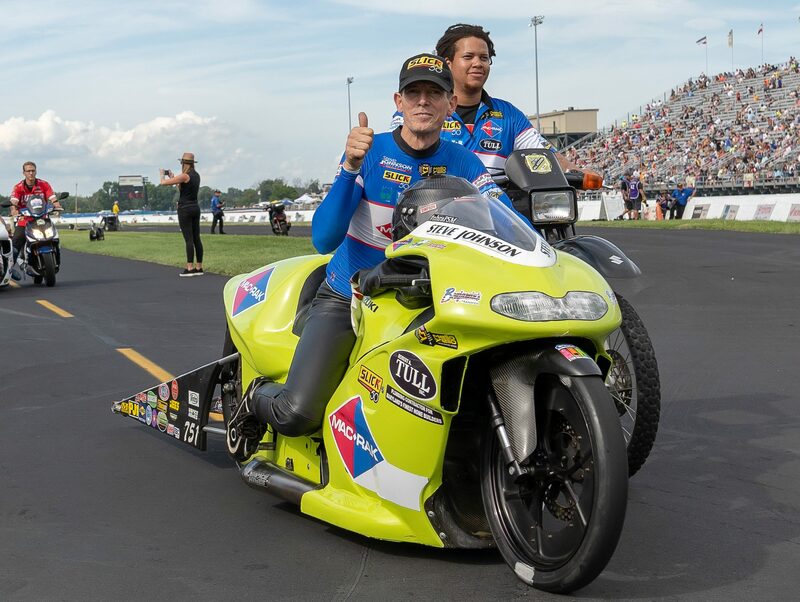 Silent to the media for the past several seasons, the longest tenured Pro Stock Motorcycle racer and Suzuki loyalist Steve Johnson fired back at Smith in a rare Facebook live broadcast. Johnson accused Smith of hurting the class, being a hypocrite and in a, perhaps misplaced, twist even brought the MeToo movement into the discussion. Johnson took exception to Smith calling Suzuki racers hobbyists for not doing more to progress. Johnson then brought up the example of NASCAR driver Brad Keselowski and Roger Penske Racing receiving engines from Roush Yates, as opposed to developing their own. Johnson then pointed out the elevated number of Suzuki female racers and accused Smith of insulting the ladies. Johnson finished up the rant pointing out how drastically different his Suzuki engine is from what the v-twins use. The debate over brand representation and equality may not be one Smith and Johnson can agree on. Statistically, Smith’s methods give him the edge. Since his 2003 debut Smith has won 22 races and produced three championships. Since his 1987 debut Johnson has never missed a race, but has been to the winner’s circle just six times. Johnson has been on the record saying there’s nothing he wants more than a championship title. The full Steve Johnson interview is below. He begins his Matt Smith rant around the 11:30 mark.